This article is 2711 days old. The Windsor Public Library has released an update to its iPhone app with features that allow bibliophiles and iOS users to better engage with the Library’s catalogue. 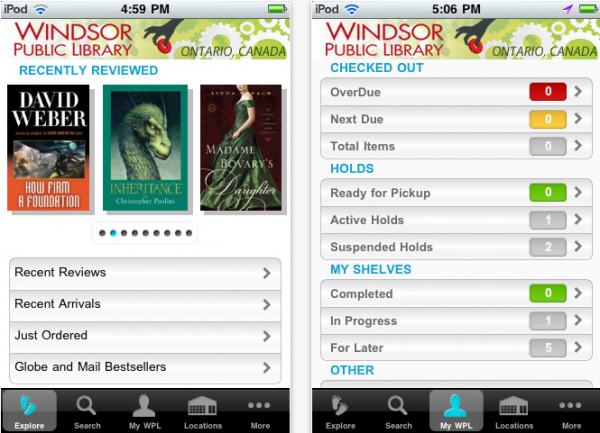 The iPhone app which already featured the ability to search the Windsor Public Library catalogue, get details on books, renew items, check branch hours, review due dates and more — now features an ISBN scanner (scan a book to see if your local library has a copy), a speedier user interface and other performance improvements. The Windsor Public Library app, produced and distributed by BiblioCommons, is available free on iTunes to iPhone, iPad and iPod Touch users. The Library also has an Android app, most recently updated in August.